Thoughts on the Doctor in S11, a few minor spoilers for the season so far. The Doctor in S11 is quite different to what we are used to. There are no big victories, no speeches, no trading on her fame or inherent power, no using her name as a weapon. What do Ryan, Yaz, and Graham actually know about the Doctor? 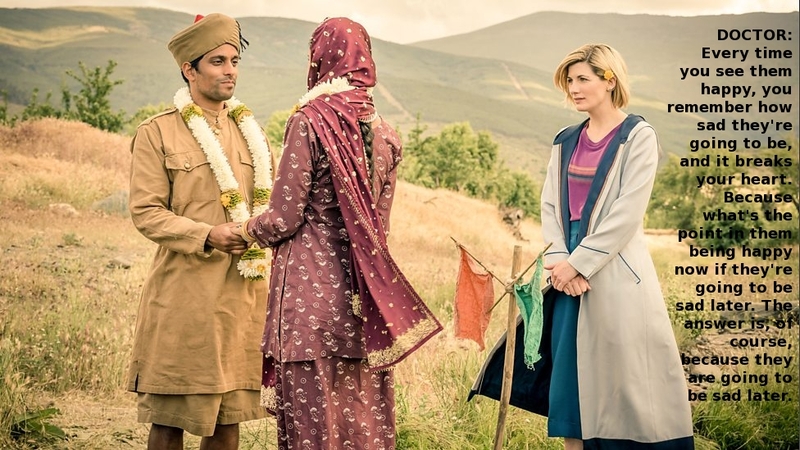 Now, from a Doylist perspective, maybe Chibnall just wants to return to a more Classic Who mould, maybe he dislikes the Doctor as the all-powerful Lonely God and just wants her to be a renegade traveller like she was in the beginning. The Watsonian take is far more interesting though. DOCTOR: You think I wanted this? I didn't do this. This, this wasn't me! RIVER: This was exactly you. All this. All of it. You make them so afraid. When you began, all those years ago, sailing off to see the universe, did you ever think you'd become this? The man who can turn an army around at the mention of his name. Doctor. The word for healer and wise man throughout the universe. We get that word from you, you know. But if you carry on the way you are, what might that word come to mean? To the people of the Gamma Forests, the word Doctor means mighty warrior. How far you've come. DOCTOR: I really didn't know. I wasn't sure. You lose sight sometimes. Thank you! I am not a good man! I am not a bad man. I am not a hero. And I'm definitely not a president. And no, I'm not an officer. Do you know what I am? I am an idiot, with a box and a screwdriver. Just passing through, helping out, learning. GLASS WOMAN: The Doctor has walked in blood through all of time and space. The Doctor has many names. DAVROS [OC]: The Destroyer of Worlds. GLASS WOMAN: The Imp of the Pandorica. The Shadow of the Valeyard. The Beast of Trenzalore. The Butcher of Skull Moon. The Last Tree of Garsennon. The Destroyer of Skaro. He is the Doctor of War. DOCTOR 1: What, what was that? I see this moment as the one driving the very last step, the Doctor seeing himself through his past self's eyes. Much like Kazran did not change his ways until he was faced with his child-self, so the Doctor's final change is quite possibly due to this encounter - River asks him what his younger self would think of him, but an idea is never as impactful as a personal experience: to see the First Doctor recoil, bewildered and appalled at what he will become. Is it any wonder that Thirteen strives to be someone her first incarnation would understand and approve of? Trying her best to find her way back to what her intentions were back when she first set off to see the universe. DOCTOR 1: You've saved him. DOCTOR: Both of them. Never hurts, a couple fewer dead people on the battlefield. DOCTOR 1: So that's what it means to be a doctor of war. The Doctor has been 'The Doctor of War' (or 'the War Doctor') ever since Eight made the fateful decision to drink of the Sisterhood's potion. A potion that was more symbolic than anything else - it was about deliberately calling forth all his darker traits and leaving 'the Doctor' behind. And regenerating into Nine did not magically change anything back; The Day of the Doctor follows the Doctor down the years, through Ten and Eleven, four hundred years of having committed genocide hanging over him. Is it any wonder Twelve delves into himself to puzzle out what kind of man he really is? And despite everything, he still dies on a battlefield, war trailing in his wake. And don't forget: Twelve wanted to die. He was old and tired and exhausted. He eventually capitulated, agreeing to regenerate, but it's no wonder that going forwards the Doctor wants to simply 'save a few people on the battlefield', rather than fight the war. To see the 'little people', rather than trying to topple the ones at the top. DOCTOR: And if there is one thing I'm certain of, when people need help, I never refuse. DOCTOR: We're all capable of the most incredible change. We can evolve while still staying true to who we are. We can honour who we've been and choose who we want to be next. […] I'm the Doctor. Sorting out fair play throughout the universe. YASMIN: Is this normal for you? DOCTOR: I'm just a traveller. Sometimes I see things need fixing, I do what I can. So, the Doctor is starting anew. She wants to fix things, to 'sort out fair play', to be a referee - and these are all roles away from the spot-light. Where the Doctor would usually step in and take charge, Thirteen does her best to listen to others and find out what actually needs doing (or not) rather than impose her will. ROSE: Where are you from? DOCTOR: What does it matter? ROSE: Tell me who you are! DOCTOR: This is who I am, right here, right now, all right? All that counts is here and now, and this is me. Except Thirteen is not a damaged shell of a man who has spent untold years fighting in the worst war in the universe. She has done the work, faced and fought her demons and chosen what kind of person she wants to be, going forward. There is no defensiveness in her replies to her companions' questions, just simple, honest answers - something which may very well be as much for her own benefit as for theirs, re-enforcing to herself what her new path is. CICERO: Wait. I've heard that name. Aren't you in the Book of Celebrants? Isn't there a whole chapter about you? DOCTOR: Me? No. Very common name. Anyway, lovely chatting. Must be off. Hope you all get better soon. (She bundles her companions out the door, before sticking her head back around the corner.) I'd say it was more of a volume than a chapter. Just so you know. The big question is – will we get a big moment? Will the Doctor be able to live her life the way she wants, or will she be pushed to use/trade on her power/history? To properly use it? DOCTOR: Don't play games with me. You just killed someone I liked. That is not a safe place to stand. I'm the Doctor, and you're in the biggest library in the universe. Look me up. VASHDA NERADA: You have one day. DOCTOR: Okay. One more. Just one. Is this world protected? Because you're not the first lot to come here. Oh, there have been so many. DOCTOR: And what you've got to ask is, what happened to them? DOCTOR: Hello. I'm the Doctor. Basically, run. DOCTOR: Do me a favour. The Fatality Index. Look up The Doctor. RAFANDO: You have an entry, just like any other sentient being. DOCTOR: Under Cause Of Death. RAFANDO: You do seem to have an impressive record of fatalities credited to you. RAFANDO: A truly remarkable record. RAFANDO: Where are you going? He's unarmed! You are unarmed? RAFANDO: You're the one who should be afraid. RAFANDO: Have a nice day, then. And what will her companions say then? DOCTOR: That thing killed hundreds of people. ROSE: It's not the one pointing the gun at me. DOCTOR: I've got to do this. I've got to end it. The Daleks destroyed my home, my people. I've got nothing left. ROSE: It's the sunlight, that's all it wants. ROSE: It couldn't kill Van Statten, it couldn't kill me. It's changing. What about you, Doctor? What the hell are you changing into? DOCTOR: But you've seen it out there. It's beautiful. DONNA: And it's terrible. That place was flooding and burning and they were dying, and you were stood there like, I don't know, a stranger. And then you made it snow. I mean, you scare me to death. CLARA: I think I'm more scared of you right now than anything else on that TARDIS. DOCTOR: You're not even really here. You're just memories held in glass. Do you know how many of you I could fill? I would shatter you. My testimony would shatter all of you. A life this long, do you understand what it is? It's a battlefield, like this one, and it's empty. Because everyone else has fallen. DOCTOR: You wait a moment, Doctor. Let's get it right. I've got a few things to say to you. Basic stuff first. Never be cruel, never be cowardly, and never, ever eat pears! Remember, hate is always foolish, and love is always wise. Always try to be nice, but never fail to be kind. Oh, and you mustn't tell anyone your name. No one would understand it, anyway. Except – Except children. Children can hear it sometimes. If their hearts are in the right place, and the stars are too, children can hear your name. But nobody else. Nobody else, ever. Laugh hard, run fast, be kind. And so far - she is keeping to it, despite the pain. But how long can she carry on?